There are no shortage of ways to celebrate the 44th Earth Day, and today Dark Horse offers comics fans the perfect opportunity to get in the worldwide celebration of eco-consciousness! 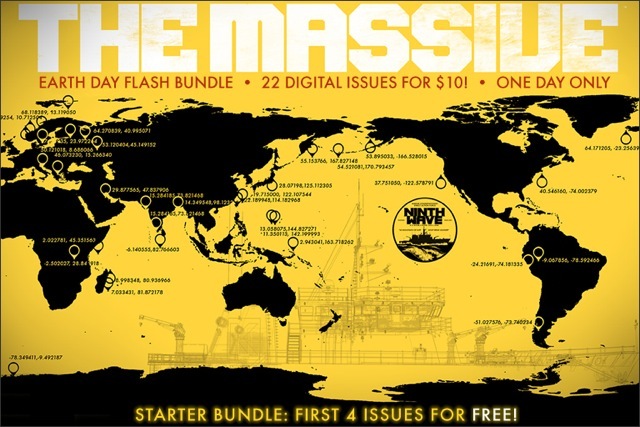 Today, and today only, Dark Horse is offering digital comics readers two special offers to catch up on Brian Wood’s acclaimed series, The Massive! 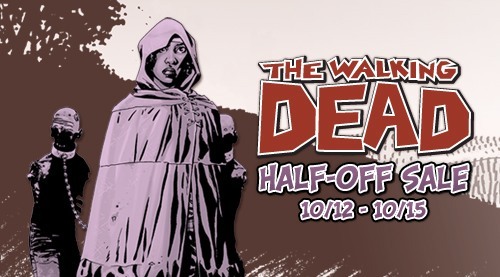 Fans can catch up on all 22 issues for only $10! Not only that, we are giving away the first four issues absolutely free! The Massive follows a group of direct-action environmentalists after the world has experienced a crippling ecological disaster. With society grinding to a halt and the planet itself in a state of rebellion, this group sails the world’s oceans looking not only for its lost sister ship, the titular Massive, but for some sense of logic in all the chaos. What does it mean to be an environmentalist after the world’s already ended? Download Brian Wood’s The Massive to your iOS or Android device, and head to your local comic shop tomorrow to pick up The Massive #22, and find out what critics have been raving about! Fear Itself flooded the release schedule this week for the digital releases, next week we get a shift to some classics and we get a Band of Heroes inclusion as well. With Marvel digging to the 80’s and even 50’s it’s hard to say they’re not working to get readers a full experience across the board. Check out the list for the play-by-play for next week and schedule your time to read all those issues accordingly. With recent changes to the Digital Store, these releases should be accessible across iOS, Android and the PC now to give you full comfort to read these where you want. comiXology is a slow-growing giant in the comic marketplace, today they expand their reach just a bit more as they partner with Archaia to release digital first products and same day digital availability as print releases. Given the reach of comiXology across iOS, Android and the web it’s not surprising to see them still pushing on for those last key partners to their reach. Part of this partnership will also reward comiXology fans with all-new material and unreleased content just for this digital experience. Some of the series coming to comiXology are included below. ComiXology isn’t the only group jumping for joy in this deal, Archaia is happy to enter the digital realm with such a wide user base to see their collection. 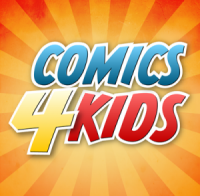 “We are dedicated to bringing our library of award-winning content into the digital forefront, and comiXology has proven the demand for digital content in the marketplace, providing readers with a simple and immediate means of accessing the latest graphic novel content. We’re excited to offer readers some of our hottest content weeks, and in some cases months, before it sees print.” Says PJ Bickett, CEO of Archaia. If you’re eager to test it out get over to comiXology now, as of the opening of C2E2 today they’ve already begun rolling these additions out for the fans! Marvel puts Ultimates up in Friday 99 cent sale! Marvel has a twist today for collectors, today’s digital sale revolves around the Utlimates series. There’s not much to really say for variations though, we’re not talking about Ultimate Spider-Man or X-Men just the base series that helped spark the side universe that we know today. Keep note that while you can access this on iOS, Android and the PC you’ll need to get in before 11:00 pm EST otherwise the window will close up and these comics will jump back to regular price. Grab them while you can! Posted on April 13, 2012 Author Gabriel VegaCategories Comics, NewsTags 99 cents, Android, Avengers, Captain America, comics, digital, iOS, Marvel, ultimatesLeave a comment on Marvel puts Ultimates up in Friday 99 cent sale! Marvel has been on a role with expanding their coverage in digital releases, their latest expansion took them to the iOS and Android realm with individual issue releases that could be taken anywhere for instant reading. 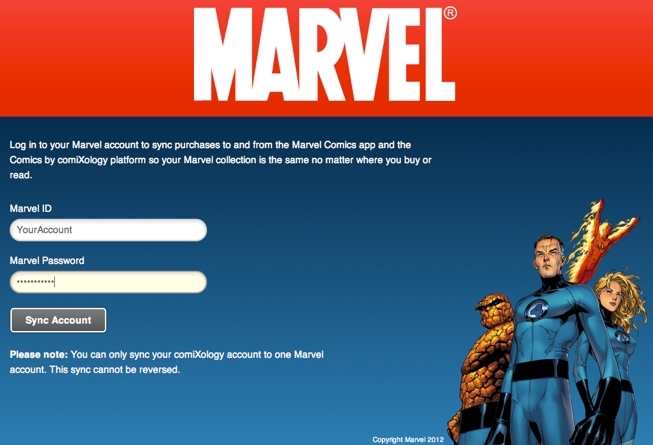 This week Marvel changes it up and expands digital comic availability to computers and iOS and Android devices, no matter where you are you can now access your comics and add to your collection without having to be on any specific platform anymore. The new store is already live and running at full force, give it a whirl and get a feel for the new Marvel digital experience.